The proposed 200 condo development was heavily opposed at public hearings. Opposition to the Draft EIR was filed by many parties with the Los Angeles Planning Department in late 2014. To date, the DEIR remains in the Planning Department with no action being taken as the developer has not responded to the comments and objections. Any condo development will require a zoning change however our Councilmember and the Mayor are in support of keeping the facility as open space. The Greenway located between the river and the Golf and Tennis facility is still being worked on by a non-profit, Community Conservation Solutions. Under its direction, trees were planted by neighbors and students from local schools with more planting and construction planned. The L.A. City project opposite the Greenway across the river should be completed by the end of the year and will become part of the continuous bike path that eventually will run from Calabasas to the ocean. 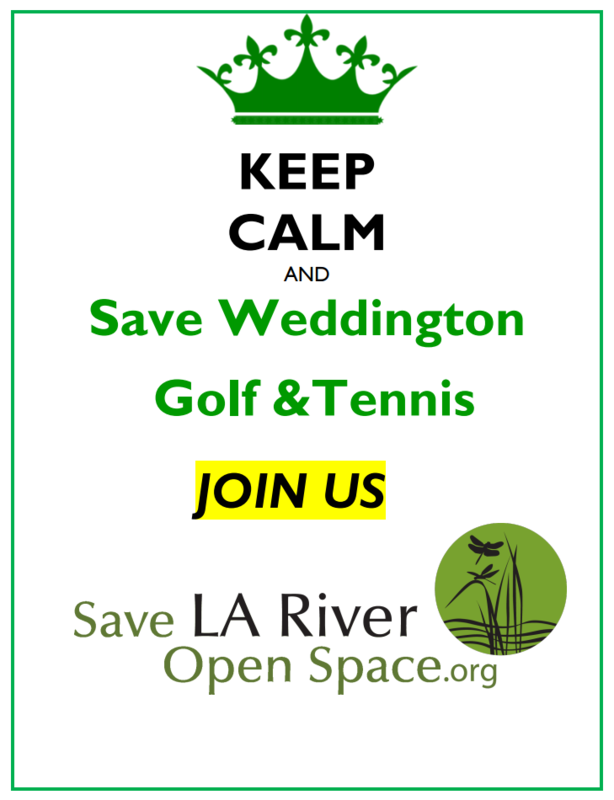 We’re still here, still fighting to save this precious open space and community fixture at Weddington Golf & Tennis from condo development. The good news is that the developers have been quiet for a while, seemingly taking stock of the huge public outcry against the development and the support of our government officials who sided with the community by refusing to consider a zoning change that would have allowed development. 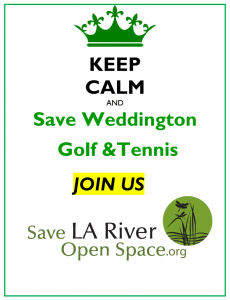 For more info, please go to our website at savelariveropenspace.org. We’re staying vigilant, and we’re asking you to show your support for the cause. We’ve given our lawn signs a new look and we ask you to pick one up and display it in your yard or window! Can’t get to North Hollywood Hardware to pick one up? Let us know and we will get one to you. Please stop by North Hollywood Hardware to pick up your new FREE lawn sign and please take one for your neighbor! Saturday – 9:00 a.m. – 5:30 p.m.
Sunday – 10:00 a.m. – 4:00 p.m.